NCAA March Madness begins in a few weeks, but what if you're not into college basketball, or you're looking for a change? Have no fear. 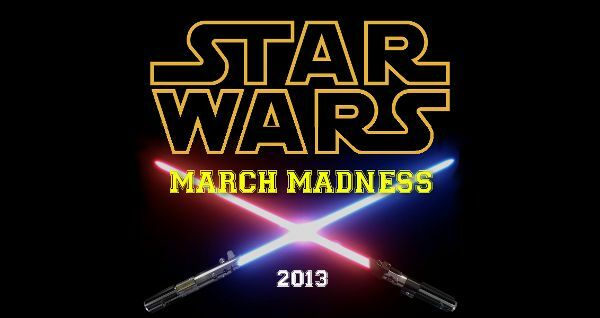 Starting on March 23rd, 18th Star Wars March Madness 2013 begins! Update: This has been changed to support the official Star Wars March Madness game. I found out this last night that there's an official Star Wars March Madness tournament. So, there's good news and bad news. First, the bad news: I'm shutting down our tournament. While I think our match-ups are a lot more interesting and our system could be a lot more fun, the reality is the official tournament has a lot more press. Doing a competing bracket doesn't make sense. I'd like to take this time to point out I conceived of this last year, but didn't have my ducks in a row. So, I waited patiently 365 days to bring this to life. I didn't steal the idea and didn't even know about it until I saw it in my Google Alert list. Great minds think alike. Now, the good news: We're going ahead with the bracket. But instead of using our voting and bracketing system we're using the official one. There's no limit on who can win now. If no one chooses the correct winner I'll just pick someone at random from the list. Follow the updated directions below and may the force be with you. It'll be "Dark Side" vs. "Light Side" and the winner will come out victorious as the greatest warrior in Star Wars. Will Darth Vader beat Jabba the Hutt? Will Boba Fett beat his son Jango? Will Luke Skywalker battle Qui-Gon Jinn? Will Emperor Palpatine fight General Grievous? Find out when the madness begins March 23rd 18th. "March Madness" is the nickname given to the NCAA Men's college basketball championships. 32 teams play each in the month of March for a single elimination championship. Each team is given a ranking or "seed" based on skill level. For example, one (1) has a better chance of winning than two (2) and so on. We're They're doing a Star Wars based single elimination round. The "bracket" is a hierarchical tree that is used to determine the winner. First, print out a copy (or use the picture below) of the Star Wars March Madness bracket. I'd recommend printing it "actual size" since it's kind of dinky. On March 17th By March 18th complete your bracket by selecting the winner in each of the games in the Star Wars March Madness tournament. Fill out the brackets and determine who you think will make it to the end. It only takes five minutes! Then go to the online form and fill out your Star Wars March Madness 2013 picks and then compete against friends, family, and other fans. Sign ups end on March 22nd. It only takes two minutes. To make it easier, you can also post who you think will win in the comments section below. Compete for your chance to win one of three virtual trophies for creating one of the top brackets. Bonus prize details below. On March 23rd 18th the voting will begin. Each day, check in and vote for who you think should win. To keep it from being a total wipe-out, and to allow for upsets like the real tournament, I'll be adding a random number to each of the scores. I'll announce the winner the next day at the end of each round. The winner will be chosen by the one who guesses the final champion. In the event of a tie, the one who guessed the highest number in the Final Four right will be the winner. In the event of another tie the tie-breaker will be the the one who guessed the highest number in the Sweet Sixteen right. If no one guesses the final champion, then I'll pick a random winner from the total list of participants. As a bonus for inviting others, if the list of participants goes over 100, then I'll give away a hardcover copy of Star Wars: Heir to the Empire, 20th Anniversary Edition to the winner. This is considered the best story in the Star Wars Expanded Universe. It's rumored the new movies will be based on them, so this is a great chance to catch up. So, go tell your friends and have some fun. This is a March Madness we can all get into. Hurry up! Sign ups end at midnight on March 22nd 18th! Are you ready to play? Who do you think will win? That sounds like fun. Probably easier than basketball brackets this year. I mean seriously college basketball stinks this year. On the good side this could be the year a real dark horse (dawg) team like the Butler Bulldogs wins it all. Another bracket to fill.. Did a battle of the fictional bands, battle of the robots, & 80s 90s hottie one. Gotta do the Star Wars one now! They must have used the Force to read your mind a year ago.